The Sky Crawlers (スカイ・クロラ Sukai Kurora) is a 2008 Japanese anime film, directed by Mamoru Oshii. It is an adaptation of Hiroshi Mori's novel of the same name. It was released across Japanese theatres by Warner Bros. Japan on August 2, 2008.Animated by Production I.G, the film was written by Chihiro Itō, featuring character designs by Tetsuya Nishio and music by Kenji Kawai. The 3D CG animation for the movie was produced by the Polygon Pictures studio, who also produced the 3D CG for Oshii's previous film Ghost in the Shell 2: Innocence. The Sky Crawlers is set in an alternative history timeline where although the world is at peace, in order to ease the tension of a populace accustomed to war and aggression, private corporations contract fighter pilots to engage in actual combat operations against each other. The film introduces a mystery involving characters called Kildren (キルドレ Kirudore?, "kill-dolls") - humanoids genetically engineered in a way that enables to live eternally in adolescence. For those who want to see a movie that is superbly done and has both a lot of action and will make you think, I highly recommend picking this up or watching it on the various streaming anime sites. Here is a link to the opening of the film from You Tube. All of the aircraft look like very modern WWII types that are vaguely based on planes with which many may be familiar. There are at least eight identified aircraft types in the film. Two have been kitted. 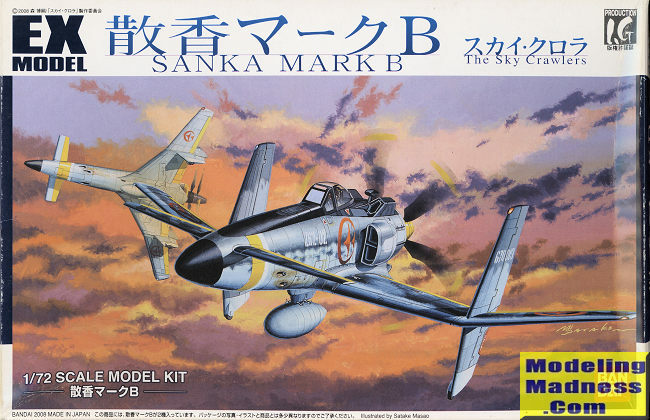 This one is the Sanka Mk.B, the standard single seat fighter of the Rostock Iron Works. It is quite reminiscent of the Kyushu J7W Shinden. A couple of years ago, I stumbled across The Sky Crawlers movie and immediately started looking for kits. 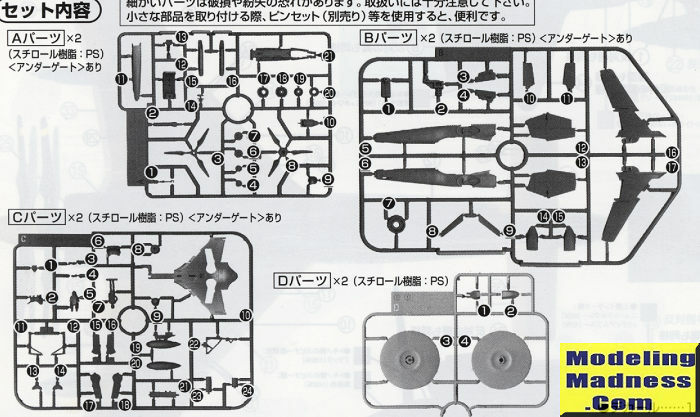 It is not unusual for Japanese model makers to produce kits based on subjects seen in popular anime films and television series. I was able to find this one from several sources, mostly in Japan for over $100.00. Too rich for me. The other kit from this series, the Skyly J.2 is even more expensive. Recently I had the opportunity to get this one for considerably less, though still twice the cover price and snagged it. This kit was also made in 1/48 and recent searches found one for $279.00 (!). This is a double kit and obviously meant for the home market as everything is in Japanese. The kits have very large mounting holes and so perhaps it is as much a snap kit as it is anything else. Surface engraving is excellent, and while each kit has a cockpit, it is really designed to have the pilot in it. There is no instrument panel or sidewall detail; just a floor, seat and stick. No nose weight is indicated and the kit will need quite a bit, though there is not really much space in which to place it. The aircraft has contra-rotating props and a gear assembly is built up for this prior to closing the fuselage halves. 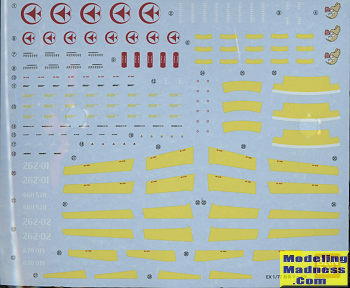 The kit has a single semi-lower wing with the lower outer wing molded with the upper wing pieces. There are also separate leading edges for the inner wing. The upper forward fuselage is a separate piece as are the upper fuselage intakes. Canards and fins are a single piece and simply slot in place. A neat option is clear discs so you can model the engine operating when in the flying mode. There is an insert for the lower fuselage for the display stand. Landing gear can either be built up and installed or you can do an in flight option with closed doors. 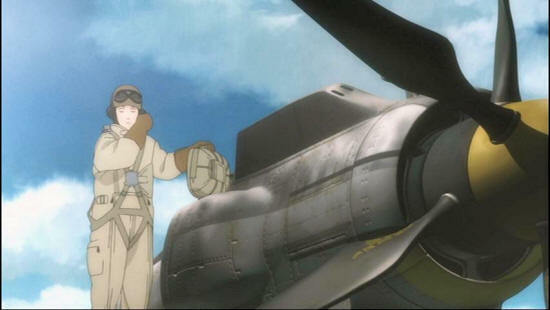 In addition to the pilot figure, the base commander and her dog are included as figures. Instructions are entirely in Japanese, but not difficult to follow. However, it does become an issue when it comes to paints as all colors are apparently generic and a lot of mixing is required. I suggest watching the movie a bunch of times to get the shades you want. All the yellow bits save the prop spinner are provided as decals. These are nicely printed and offer markings for the two main male characters. I am sure most of you are shaking your head on this one. However, if you are a fan of anime and have seen this movie, it is a kit you may well be willing to pay more than retail to obtain. The models will not be large, but they will be different.